Provide comfort for the family of Terry Elson with a meaningful gesture of sympathy. Terry L. Elson, 71 of Ashland passed away, Thursday, March 28, 2019 in University Hospitals Samaritan Medical Center. He was born July 18, 1947 to the late Roger and Norma (nee Repp) Elson in Ashland. Terry retired after more than 47 years from the Ashland Times-Gazette as a pressman. Online condolences may be shared on the funeral home’s website at denbowfh.com. Denbow-Gasche Funeral Home & Crematory is handling the arrangements. To send flowers in memory of Terry L. Elson, please visit our Heartfelt Sympathies Store. We encourage you to share your most beloved memories of Terry here, so that the family and other loved ones can always see it. You can upload cherished photographs, or share your favorite stories, and can even comment on those shared by others. Provide comfort for the family of Terry L. Elson by sending flowers. We're so sorry, Mandy. Love you, Aunt Sharon and Uncle Jim. So sorry to hear of Terry's passing. I've known him since the late '70's and worked with his Dad, Roger at Abbott. Sincere condolences to the family and he will be missed. May the family of Terry L. Elson please accept my sincere condolences hoping you find comfort in God's words at Acts 24 : 15 and Psalm 37 : 29. I'm so sorry to hear of Terry's passing. He was always a pretty nice person! 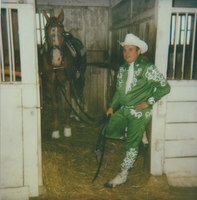 I use to show horses with him. He had some beautiful horses. Love to see him in the silver saddle classes.